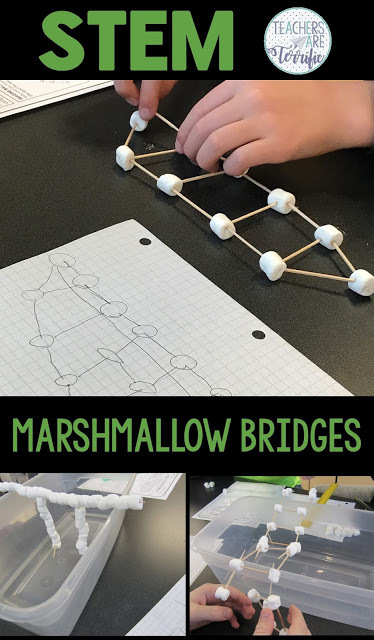 Oh my, the first time we used marshmallows as a building material was such a learning experience! 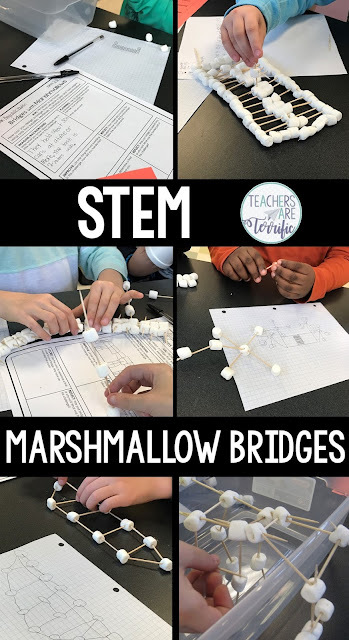 I have some tips for you sprinkled throughout this post that will help you breeze right through a STEM Challenge with marshmallows! Our first building project was a Bridge! Since we had no idea what to expect with this challenge it was great fun for everyone. Seriously. I think the STEM Lab is the most fun when I don't even know what is going to happen. Kids love it when something surprises me! TIP: Repeat projects you enjoyed with your class. The second time is even more amazing than the first time since your students will have grown as engineers and you will have a different way of presenting the topic. The first time we tried a bridge I wasn't sure what to use as the "span" section for the structure. I wanted an opening that would be 5-6 inches because I did not think these bridges could be very long. Pushing two tables close together is the answer, but my tables are very heavy. I decided to try something lightweight and movable (at least more movable than my 9 foot long tables)! You can see what we used in the photo above. Tissue boxes! I had plenty of those! I set up two boxes on each lab table and taped them in place. Each team had their own spot to try their bridge. Now to the dilemma of using marshmallows! If you buy the name brand kind of marshmallow you are likely to find that the marshmallows are very fresh. This is ideal for making hot chocolate, but not so good with bridges. They are just too soft. TIP: Open your bag of marshmallows the day before you plan to use them. They will harden overnight and be just right for making something. My original thinking about this bridge made with toothpicks was that the students could not make a support leg underneath the bridge. My thinking was that the students would have to work hard to make the bridge work and I wanted them to concentrate on creating the bridge- not spending time making legs. This turned out to be futile! They wanted to make those support legs under the bridge to help hold it up! Of course, they did! In the pictures above you can see two great bridges- one with a support column and one without. TIP: If you try this bridge, be sure you allow an exploring time with the students. I found it very helpful to have each group try joining the marshmallows with toothpicks just as an experiment. After a few minutes of this, I had each group share a method they found that worked well. Check the photo of the bridge above. Can you see that the team doubled the number of toothpicks that joined each set of marshmallows? Clever! A year went by and we decided to try this bridge again. Instead of using tissue boxes I decided to try a plastic box. I have a large amount of these plastic shoeboxes and I thought it would be perfect. If we built the bridge going from one side to the other of the bin it would be a good length and the stiff sides would help hold the bridge in position. This time I allowed students to make support columns for their bridges. Some built the legs and some did not. Above in the bottom photo, the team added their little columns when the bridge started to sag a little. Fabulous improvement! TIP: Toothpicks can be very sharp! Caution students about this as they begin to work. I do use round toothpicks because they are more sturdy than flat ones. The first class tried the plastic bins and just built their bridges. I decided to try something new with the next class. What if they had to create a blueprint of the bridge and then build it exactly like the blueprint? You have to try this in your STEM class! Just hand out some graph paper and watch. I had teams plan together for the design of the bridge and one student sketched the final plan. Then they set out to build it just like their sketch. Check the one above. That's pretty good, you have to admit. The team in the photo above had a very detailed lattice to create for their bridge roadway. Take a look at that blueprint! Amazing job! What fun! This is a STEM project that is quite challenging. My resource has all the details and includes the blueprint version, too!